NABSQNO 16S-323760-4155080. This unnamed arch is a young alcove natural arch. The opening is still a prone, slotted aperture with a span very much less than the horizontal extent of the alcove beneath it. If the vertical joint that separates the lintel from the occluding cliff widens so that the opening is transformed into a semicircular aperture, it will have a span of about 75 feet. Of course, that will only happen if the arch reaches an adult stage before it collapses. The current span is about 25 feet. 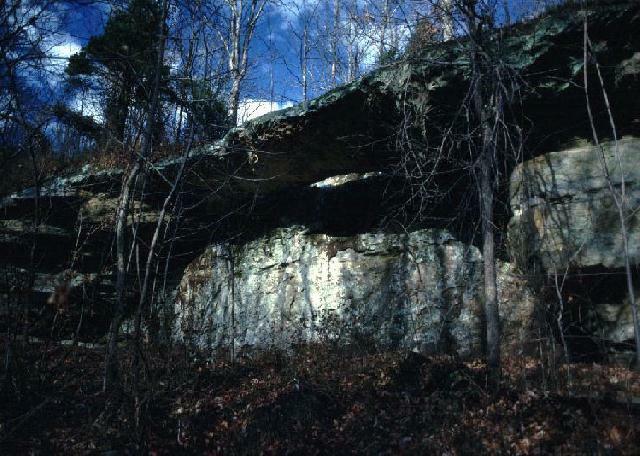 The arch is located in Ferne Clyffe State Park, Johnson County, Illinois. It is accessed via a maintained trail of just under 2 miles.